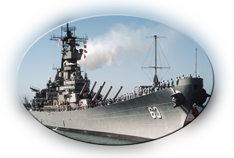 The USS Missouri is one of the most famous vessels in the history of the US Navy. She played major roles in both World War II and the Korean War. 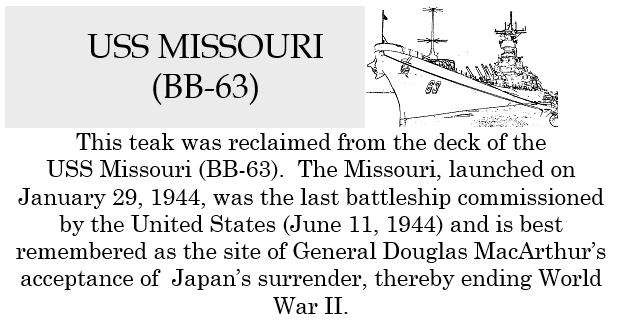 The Missouri, launched on January 29, 1944, was the last battleship commissioned by the United States (June 11, 1944) and is best remembered as the site of General Douglas MacArthur’s acceptance of Japan’s surrender, thereby ending World War II in 1945. She was decommissioned in 1955 and placed in mothballs until 1984 when she was recommissioned in 1986. She was decommissioned for the second time on March 31, 1992 and currently sits at Pearl Harbor near the famous parabolic memorial to the sunken USS Arizona. A customer who had ordered two special orders from me previously, contacted me to see if I could make a pen for one of the Navy shipmates he had served with on the USS Missouri using wood from the deck of the Missouri which he could supply. A card, pictured here, accompanies the pen and salutes the restoration efforts that have made this unique wood available. Of course, I was excited about such a neat and sentimental opportunity. As I was working on it, he asked me to keep a piece to make a pen for him later and told me to keep a piece to make myself a pen. I have carried many different pens over the years but I have carried this one longer than any other. I found it to be a very rewarding project and made one as a gift for a friend who is a Navy vet. Although he didn’t serve on the Mighty MO, he was very pleased to get such a unique piece of Navy history. I hope that you might find this unique piece of US Navy history as intriguing as I have. Click here to order pen. Although the box is not made of wood connected to the Missouri in any way, I though this rollerball pen deserved a special box with a laser engraved picture of the ship along with a couple of the significant dates. 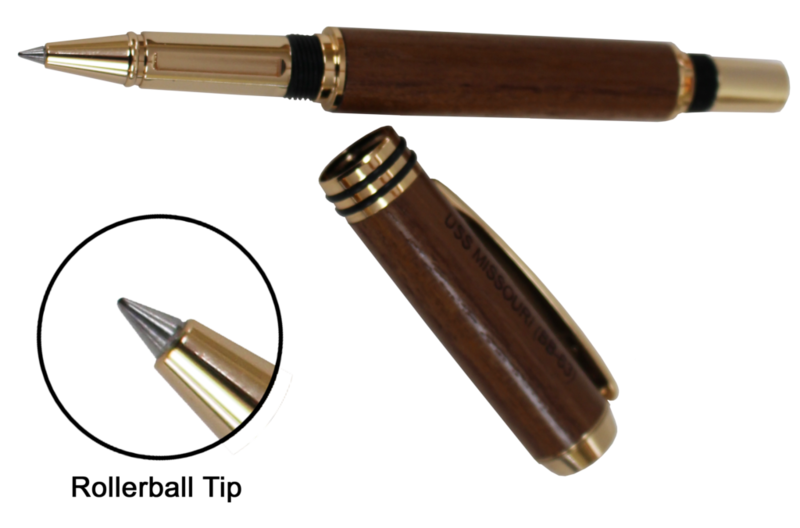 The box pictured below is the only one available for the USS Missouri rollerball pen. No substitutions available. Click here to order box.